One night back in November of 1988 at a Middle School gym in Owenton Kentucky a much younger version of myself was playing an 8th grade basketball game… the coach had just drawn up a play in which I would get the in-bounds pass and have a chance to score. My heart was pounding as I made my move and caught the ball. I remember spinning past the kid who was guarding me and breaking away in the open court as the crowd went wild. I made the lay-up and began my celebration but immediately realized something wasn’t right. The reaction of coach Reynolds was odd and why wasn’t my team on this end of the floor with me…? You can imagine the horror when I figured out that I had just made a wide-open lay-up on the opponent’s end of the court. Turns out the crowd was going wild trying to get me to stop. Fast forward to a night in November of 2011 in a Middle School gym… a 13 yr. old Carson Williams was playing an 8th grade basketball game when he came flying through the air and completed an alley-Oop dunk like you would see at the college level. That dunk would be the beginning of an incredible basketball journey for Carson Williams. That journey will come to a culmination in Indianapolis when Carson and his NKU team take on the Kentucky Wildcats in the NCAA Tournament Friday night. I told you about my big middle school moment because that was more of the norm when it comes to the athletic prowess of a 13-yr. old where I grew up. Don’t get me wrong there have been a lot of good athletes come from Owen County but nothing like Carson Williams. You just don’t see too many 13yr old’s making plays like the one in the video above and there aren’t many 18-yr. old’s who could pull it off either. In small rural areas, it’s hard sometimes for kids like Carson to get the attention they deserve. The AAU programs have really helped but it still isn’t easy to get on the right teams and get on the right courts. And when you do get on the right team and the right court you must take advantage of the opportunity. Carson took advantage of the opportunity and dunked his way through the AAU ranks and landed a spot on the Lexington based Kentucky Travelers basketball team. The Travelers are a Nike sponsored AAU team who play in Nike’s Elite Youth Basketball League. Carson had his needle moving performance in AAU while at an event in Virginia back in May of 2014. That weekend Carson was 1-1 3pt, 22-38 FG 58%, 16-24 FT 67%, had 23 Rebs, 2 Assts, 3 Stls, 2 Blks, and 61 points. It was after this weekend in Virginia that scouts really started to take notice of the hometown kid. Carson Williams: He is a strong and athletic wing and could be a very skilled 4 at the next level depending on future team and scheme. He plays hard, can shoot to 19 feet and will dunk on you if you are not paying attention. He had 21 in Kentucky Travelers’ loss to Team United (N.C.). The 6-5 small forward can be a mid-major stud or a great role player at a high-major school in the 2016 class. 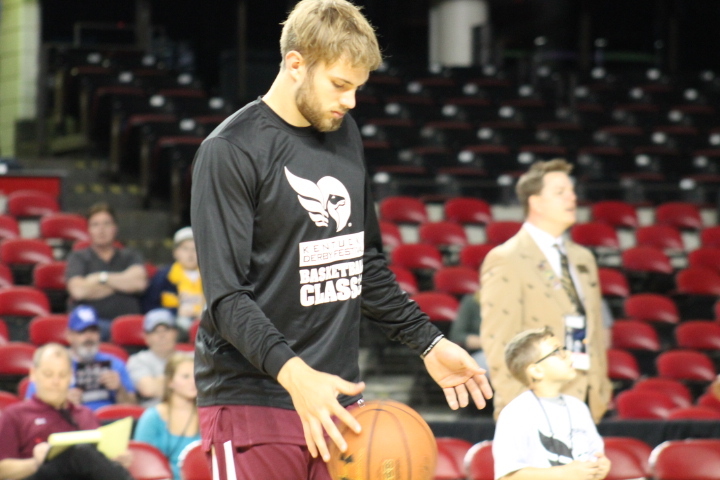 It was his time in the AAU that really helped him get the important notoriety but Carson Williams also dunked his way to a very successful run at Owen County high school setting records that will last generations. He helped his team win a lot of games and a lot of District championships including a few trips to the All-A State semifinals. With the help of Williams, the Rebels basketball team was considered one of the best in the state even ranked in the top 10 of some polls. Carson never got the chance to play in the state’s biggest game but he did win Kentucky’s highest basketball honor the title of “Mr. Basketball”. This past summer Carson’s journey landed him in the Derby Festival Basketball Classic. It is one of the premiere all-star games in the country and has seen many greats come through it. Carson had a great showing at this event and was a semifinalist in the dunk contest. It was a great night of celebration for all that he had accomplished as a high school player. I was proud to tell the other media court-side that he was from my hometown. Carson Williams decided to continue his basketball journey at Northern Kentucky University. And he has been that mid-major stud in his first college season that all those scouts said he would be. He earned Horizon League freshman of the week honors a few times and has become an important part of the Horizon League Tournament Champion Norse basketball team. Carson said that he chose to go to Northern Kentucky to help build the newly Division 1 program into a dominate player in the Horizon League. He said that he wanted to help them get to the NCAA Tournament. In year number one its mission accomplished. There are a lot of great college basketball players that fall short of the dream of playing in the NCAA Tournament. Friday night Carson Williams will be representing all the years of hard work and dedication that it takes to achieve such a goal while overcoming the odds of coming from such a rural area. It also takes a bit of luck. But good things happen to good people and you won’t find a better young man. Carson will be the first player from Owen County to make it to the NCAA Tournament during the modern era and only the second ever. He will be representing all the folks that grew up there. Everyone has followed along on his journey and has a lot of pride for his accomplishments. One of the reasons he went to NKU was so his family, friends and community could come to his college games. It’s only about an hour from Owenton to Highland Heights as the crow flies. Carson brought a lot of hometown spirit back to those Owen County school gyms and that spread throughout the community. It also spread to folks from there that live all over the country. I reached out to Carson Williams and his family and asked them what it meant to be playing in the NCAA Tournament. Many of the same folks that were in that Middle School gym the night Carson had that big dunk will be at Bankers Life Fieldhouse Friday night. And the folks who can’t make it will be tuned in to watch their hometown boy fulfilling yet another dream. That kid who put the ball in the wrong basket will be there too. I love being a Carson Williams fan and watching him play takes me back to my younger days. I didn’t have an ounce of the ability but at one time I did have a similar dream. I wrote this week about the special moments we often see during March Madness. It is three weeks where real life dramas play out during a College Basketball Tournament. For Carson Williams, his family, his fans, Owen County and NKU Friday night will be that special moment. Good Luck Carson! Good Luck NKU!